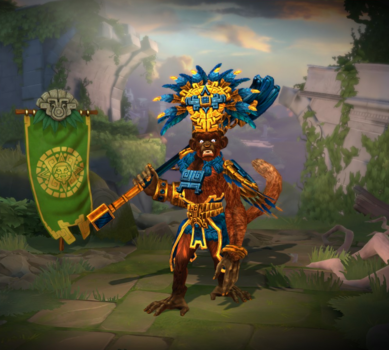 Hun Batz is one of the playable Gods in SMITE. Grants immunity to directional movement penalties while firing. Can be deployed in walls. Can deal up to 120/175/240/315/400 (+60/75/90/105/120% of your physical power) damage. As Hun Batz teleport to an enemy God on the last bounce of sacred monkey. Hun Batz was a free starter character for every new player account created before June 20, 2013. 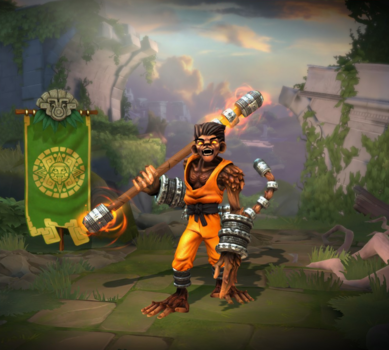 Months before the current Sun Wukong was released, the original Sun Wukong went through a major revamp on June 20, 2013 that turned him into Hun Batz. 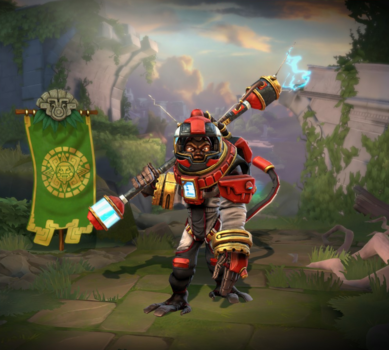 After the revamp, Odin temporarily replaced him in the free starter character set until July 10, 2013. The name and icon of Hun Batz's Ultimate, Fear No Evil, are both references to the Three Wise Monkeys. 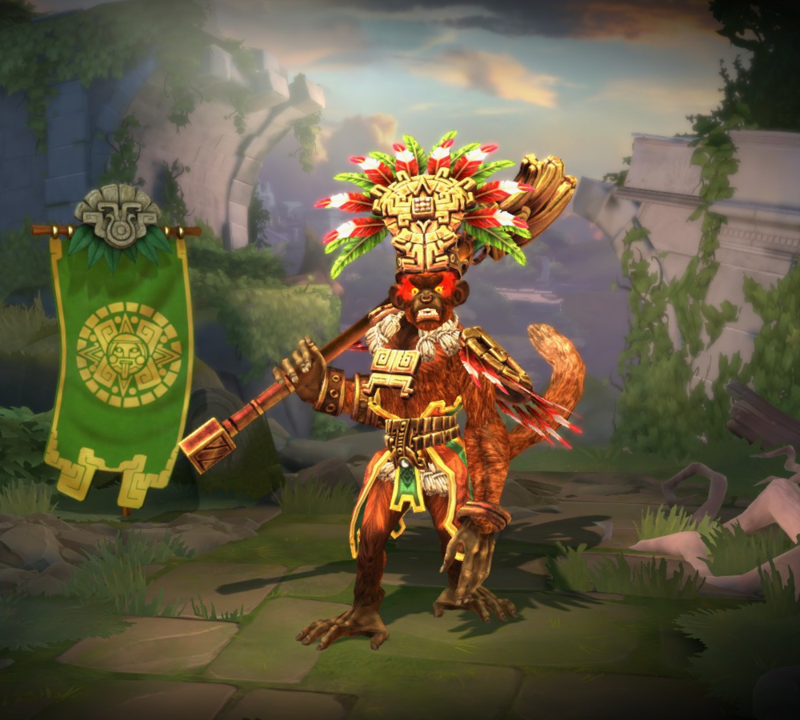 Hun Batz's dance social emote is based on the dance known as, The Monkey. 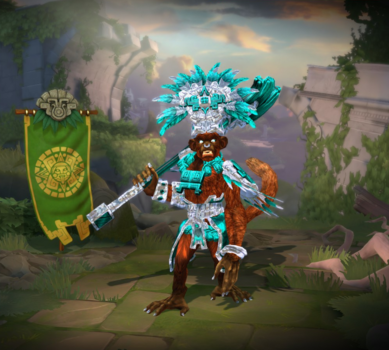 The skin, its ability targeters and ability effects constantly rotate between several colors. This ability can now rehit minions but still only hits Gods once. This effect now causes Hun Batz' next successful basic attack to deal 20% more damage. Hun Batz is no longer affected by directional movement penalties while this ability is firing. Increased Damage from 80/125/170/215/260 to 80/135/190/245/300. Decrease mana cost from 75/80/85/90/95 to 60/65/70/75/80. Added additional voice lines for VGS. Teleport has received some quality of life enhancements. Added sound fx for teleport. Added a directional ground targeter/timer underneath Hun Batz and target that appears after hitting the last living target. Updated targeters for Shaolin Monkey. Fixed a bug where his body would persist until he respawned. Critical chance reduced from 50% to 30%. This ability may now be activated again to teleport to the next god hit, or to the last god hit within 2s, if the monkey has already completed it’s travel. Fixed incorrect tooltip scaling value. 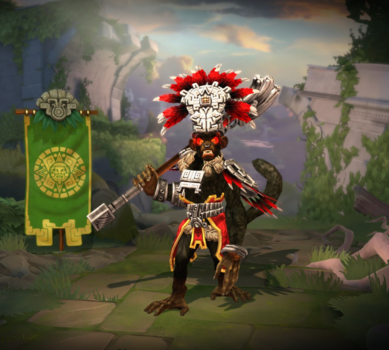 Hun Batz has a new, faster, attack progression. 1/.75/1.25 damage. Fixed an issue where Hun Batz’s animations would lock up when moving forward and right at the same time while out of combat. This ability no longer requires line of sight to fire as long as the center is in a valid location. This ability has been changed so that, after firing the ability, pressing the ability button again will now teleport to the next target hit. This ability has been changed to give a 50% critical strike chance buff on the next basic attack within 3s after an ability is used. No longer allows Hun Batz to teleport out of Fenrir’s mouth during Ragnarok. Increased from +20% physical power scaling to +25% physical power scaling. 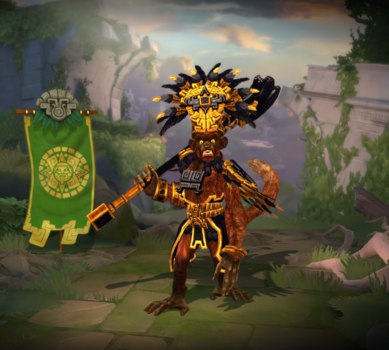 Hun Batz now gives a voice cue when he uses this ability. The base damage per tick has been reduced from 40/45/50/55/60 to 30/35/40/45/50. The 4th hit of his melee progression no longer hits nearby targets. The physical power contribution of this ability has been reduced from 100% to 85%. The base damage of this ability has been reduced from 85/150/215/280/345 to 75/130/185/240/295. Range of the bounces for rank 1 of this ability was shorter than the other ranks. This is now fixed. This ability no longer goes on cooldown when it is cancelled by crowd control abilities. This page was last edited on 12 April 2019, at 06:55.